The snug room was our favourite room of this refurbishment. With underfloor heating throughout and beautiful crittal doors to shut off from the rest of the house, it’s the perfect space for lazy Sunday afternoons. The diner style dining area and kitchen complete with larder was also a fab addition for this busy household. The kitchen is definitely the heart of this home. 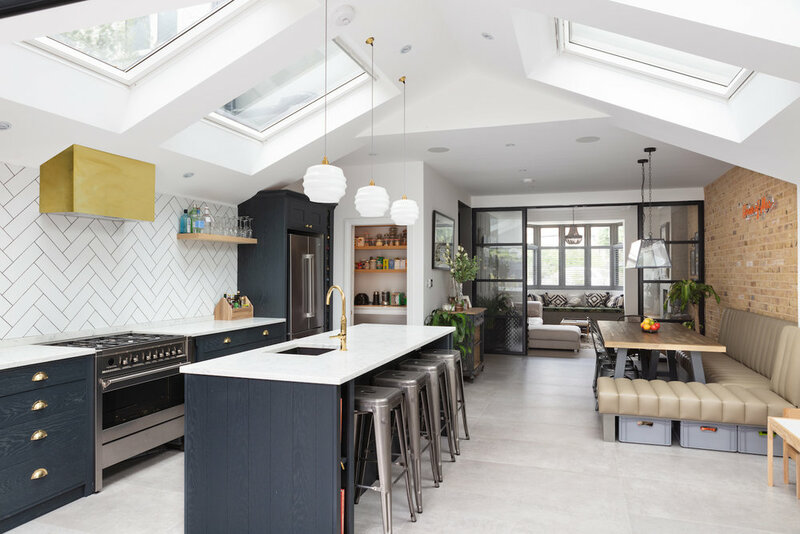 The extension of this standard two up two down victorian cottage in Wimbledon was the perfect opportunity for the owners to completely re think the space and extend the house to create a family home for life. The open plan living works well for young families and the indoor/outdoor space with the south facing garden makes for great summer months. 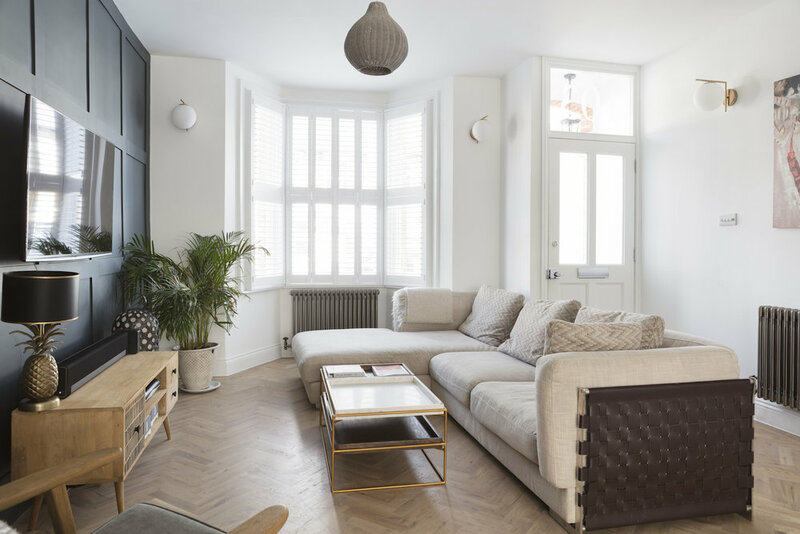 The reclaimed oak parquet floor and the antique crittall window were the highlights of this refurbishment. We created a great entertaining area and maximised space by opening up the kitchen, living and dining areas. Light from the roof terrace shafts through the carefully placed antique window to brighten up what was once the darker side of the property. 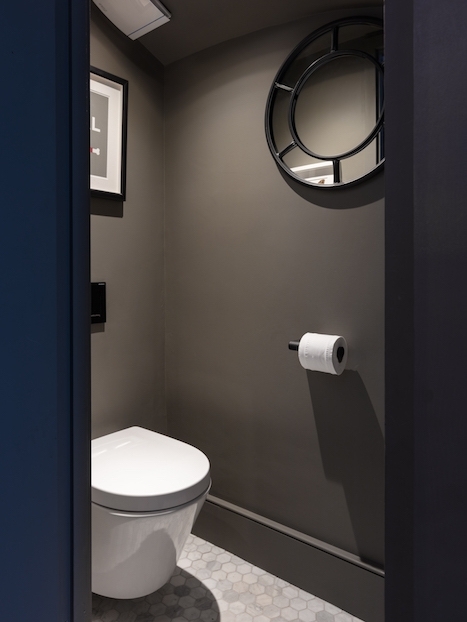 We finished it all off with lashings of downpipe grey to add some sophisticated drama. A loft extension in this double-fronted Victorian flat provided a great opportunity to make the most of the lateral space of the building. By flipping the living to the loft, we created a contemporary open-plan living space with endless light thanks to the large skylights, bifolding windows and doors. 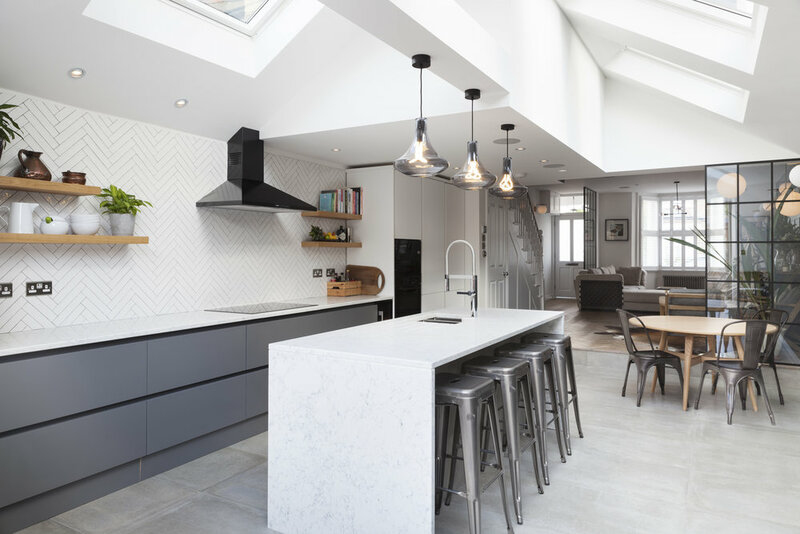 The white-wash oak parquet flooring compliments the grey shades beautifully, while marble touches throughout the house give it a touch of luxe. Our Russell Road project was such a success we were asked to completely duplicate the design around the corner on Palmerston Road. The layout largely remained the same as well as some key design elements, however we added a sprinkling of copper in the kitchen for a bit of bling and had the luxury of more space in the family bathroom to create a turquoise haven. 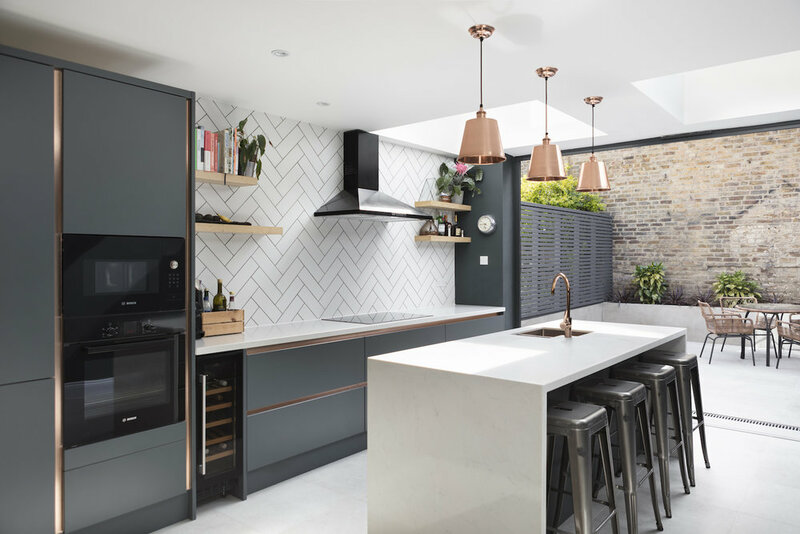 With the full refurbishment of this Victorian terrace, our clients wanted to use the opportunity to give their house a completely new look. 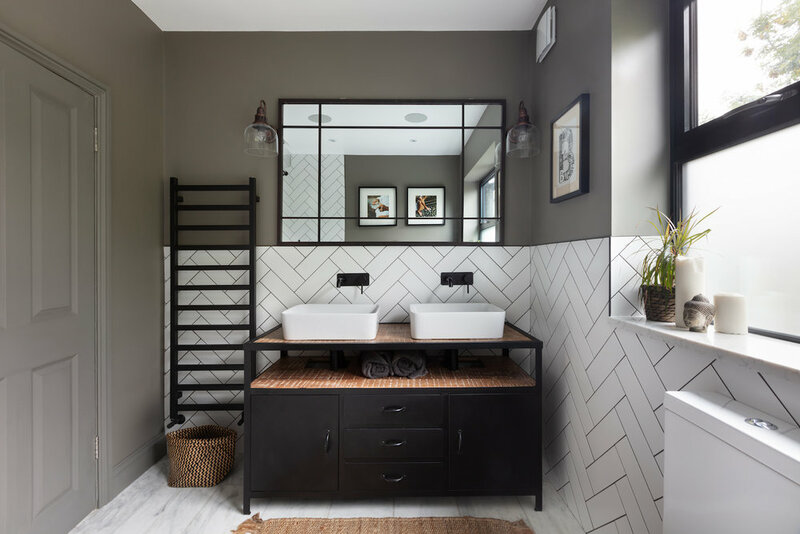 We used panelled walls and mosaic tiles to give the place a colonial accent, alongside exposed brick and sanded oiled floors for a rustic feel. For the master bedroom, we went for full luxury with a walk-through wardrobe and large en-suite, complete with cast-iron, roll-top bath. This refurbishment was done to very tight budget. We started by sanding back floorboards and exposing select brick walls to maximise the home’s existing features. Reclaimed ship lights and fireplaces hearths sourced from eBay were a real steal. It's amazing what can be achieved with some careful sourcing!